Companies across industries use a lot of paper. With an increase in digital crime, paper documents are susceptible to theft and misuse. It is important to create a culture of security at the workplace so that confidential information is protected at all levels. Old paper documents take up valuable office space and affect efficiency. The documents cannot just be dumped. They need to be thoroughly destroyed and recycled. Sensitive information should be disposed of with utmost care. A certified paper shredding service ensures privacy, security, and compliance with the latest regulations. The services are also customized to meet the specific needs of the industry. A risk assessment at the workplace will help in identifying areas of risk. A comprehensive shredding schedule will ensure that documents are destroyed at the right time. This helps in protecting confidential information of your company. Our certified paper shredding is provided on-site. Mobile shredding trucks arrive at the location and documents are shredded at the site. The entire document destruction process can be viewed on the active video screen of the truck. After the entire process is completed, the shredded paper is transported back to the recycling facility. The mobile trucks can shred tons of paper each day. The trucks feature extensive security features. The certified paper shredding service collects documents from the business premises and transports it securely back to the facility for shredding and recycling. Documents in all forms are accepted for shredding. The documents are collected in secure bins or containers. This prevents any unauthorized access to the documents. The highly efficient shredding and recycling equipment make the entire process economical. Most businesses experience the need for a thorough clean up of documents from time to time. There are also special projects or situations when a large volume of documents need to be systematically purged. The purge services are available for small and large purges. They are often used for annual clean up of documents or during relocation. Documents are purged for compliance or legal purposes too. Finalization of a litigation or audit can also result in the purge of documents. Start protecting your company by purging documents that are no longer needed. Our regularly scheduled shredding service is an ideal choice for companies that need to destroy confidential information on a daily basis. 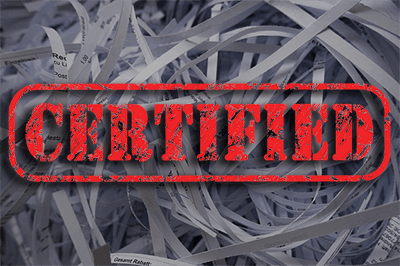 The certified paper shredding service assesses document produced on a daily, weekly and monthly basis and designs a customized plan to destroy and recycle documents. The scheduled paper shredding services help promote efficient document destruction practices. Security of the confidential information is enhanced with secure, lockable containers. Regular certified paper shredding of unwanted documents will help keep the office organized. It can help your company stay in compliance with document destruction rules and regulations. A certificate of destruction is issued after all the documents are destroyed and recycled. The certificate clearly states how many documents were destroyed and is proof that the documents were destroyed in a safe and secure manner. We include these with every data destruction service we perform. 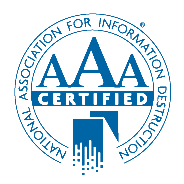 IntelliShred is NAID AAA Certified as well as being a member of NAID (National Association for Information Destruction). 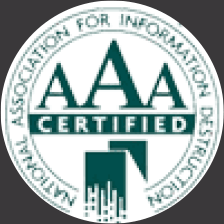 This certification is the highest level of security in the shredding industry. It ensures that confidential information pertaining to your business, customers, and employees is protected at all times. The highest ethical standards and practices are followed when shredding confidential documents. This makes the process efficient and gives business owners peace of mind as all documents are destroyed and recycled in a professional, safe and secure manner.